Two fellas, a kid, a woman and a horse. Every now and then a little thing happens, quite out of the blue, that reminds you of how interesting the people of Andalucía can be. They have a kind of joie de vivre and spontaneity which many of the rest of us may lack. Or maybe they just suffer less from the stifling self-consciousness that prevent those hailing from northern Europe from letting their hair down a little. Something happened just a little while ago which shows the free spirit of these people and I thought it would be nice, while it is fresh in my mind, to record it. It so happens that my daughter Pippa is rehearsing a role for the musical “Grease” and I find myself driving her to and from rehearsals every day. If the rehearsal is long enough, as it was today, I return home after dropping her off at the theatre in Fuengirola. This is a longish journey and to break it up I often drop into a BP service station en route to grab a coffee and maybe read for a while. 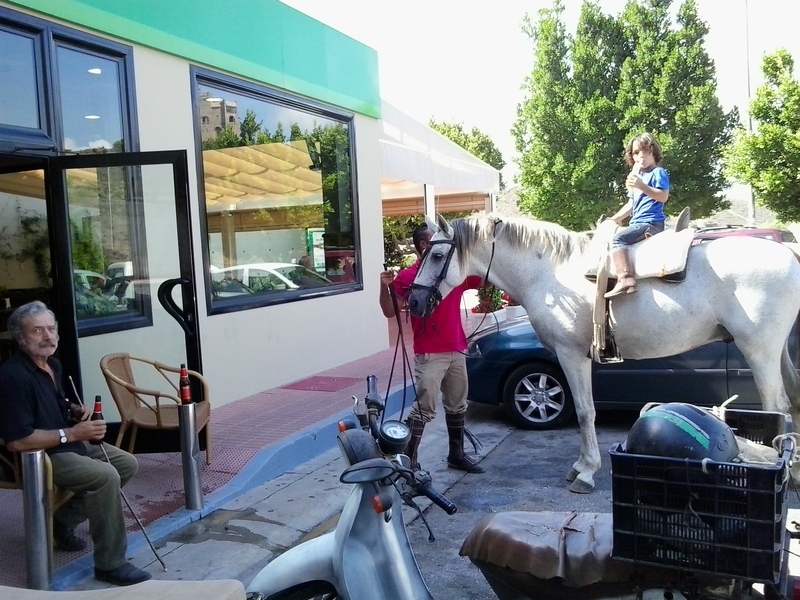 When I got to the cafetería today I noticed there was a horse standing outside the entrance. 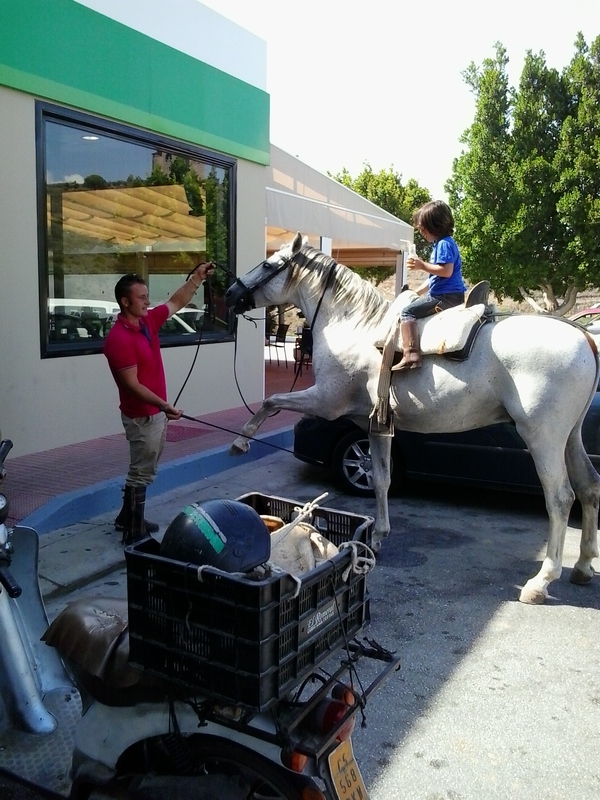 A couple of guys were sitting next to it on chairs that had carried outside from the cafetería and a kid was up on top of the horse busily devouring a packet of crisps. This looked like quite an interesting little scene to me so I asked one of the guys if I might take a picture or two with my phone and he was happy to let me go right ahead. He later asked me to show him the photos and seemed happy enough. So I thanked him, went inside and settled down with a coffee. 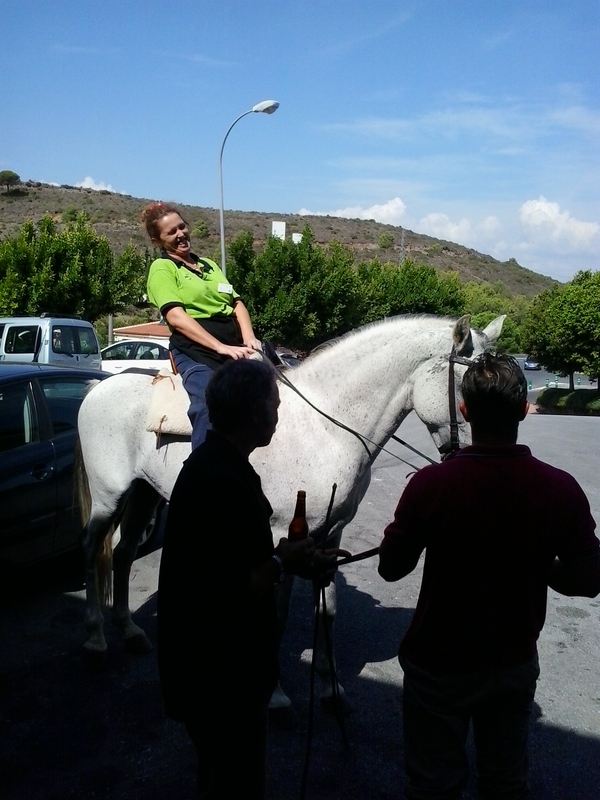 So up she hops on the horse to the amusement of her colleagues and the various motorists who were having their cars filled up with petrol. Next, out comes somebody with a fan for her to wave, followed by an improvised shawl and she laughed and joked as her friends took out their own phones to capture the moment. A few minutes later she was back inside attending to the routines of her day. She was mopping the floor of the cafetería as though nothing untoward had happened. The boys outside soon finished their beers and returned their chairs. One then climbed up onto the horse and the kid was passed up to join him. Then off they trotted down the road. The other guy climbed onto an ancient moped and was soon gone. Then, my coffee finished, it was my turn. Horse not doing cool things. The ancient moped can be seen in the foreground.